Well this is where the painting all started – Skye – about sixteen years ago on a walking/climbing trip with my good friend David. 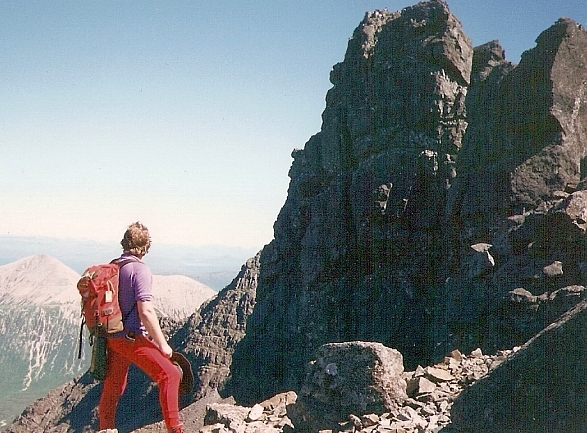 Well this is where the painting all started – Skye – about sixteen years ago on a walking/climbing trip with my good friend David. It is still affecting my painting right up to today. Why? You may ask. Well my latest exhibition at Whalley Library that’s showing this month is influenced quite a bit by my paintings of Skye. The exhibition has three Skye paintings. Two of them are traditional watercolours, the first, Black Cuillin from Sligachan, which is a watercolour painted in a long thin panoramic format was the start of the first day’s walk up onto the Black Cuillin ridge to the Basteir’s tooth seen in the picture. The second traditional watercolour is of The Needle found on the Trotternish Peninsula, which was seen on our second day of walking. It’s the third picture that has resulted in some divergence from traditional landscapes and is responsible for some of my more abstract landscapes. You see Basteir’s Tooth, Black Cuillin, is a line and wash picture that was drawn to show all the different shapes of the slabs that make up the monolith. The result was something that looked like a landscape but also had a touch of cubism thrown in there, by accident none the less. The Basteir’s Tooth painting has been admired by some and hated by others (always a good sign) but its style got me thinking (sometimes a bad sign) about what else I could do with this method of using line to depict different angles of rock slabs. The first result was Mystery Buttress, Widdop Moor – an exaggerated line and wash that has produced a painting with many hidden faces. The next step was to try something out in acrylic using a solid line and two differing colour temperatures to delineate the background from the foreground. The result was Napsicus, so called because it is drawn from Napes Needle but looks like a robot out of Transformers. The last one to mention is Hornicus which was painted in a reverse way to Napsicus, that is the warm colour forms the background while the cold colours form the rock so compressing the painting. Its name comes from the fact it is based on the Matterhorn but does not use the bold lines of the previous painting, relying on the different directions of brush strokes to produce planar divisions. But let’s return to Skye rather than the twisted world of abstract. Skye, that inspired me to pick up a paint brush and get formal painting lessons. Skye, that still inspires the paint brush and looking through my photographs has now inspired me to paint a new picture of the island’s wonderful landscape. Why? Well you see in writing these notes I have realised that only the first two days of walking are represented by my paintings, the third is missing a suitable painting. So I'm off to pick up my paintbrush and remedy the situation. With a bit of luck it will be on display in Rebound, a bookshop on Broadway, Accrington, by the end of the week together with some of my other paintings. Also watch out for it later this year at Nursery End.